The following guidelines should help you determine your ring size but we recommend visiting a local jeweler to get a precise answer. Select one of your own rings that fits the intended finger. Measure the inside diameter in mm (see photo on the right) and refer to the diameter column in the chart below. Wrap a piece of paper around the bottom of your finger (make sure it's not too tight so it can get over your knuckle). With a pen, make a mark at the intersection. Measure the length (in mm) and refer to the circumference column in the chart below. Please note that your fingers size can change depending on the time of the day and the weather. In the morning and when the weather is cold, your fingers will be smaller. When it's hot, your fingers will expand so it is best to measure your fingers at the end of the day and when your hands are warm to get the most accurate answer. The most common women's ring sizes usually fall between a size J and a size O. 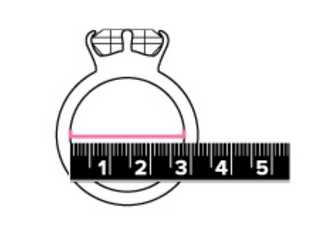 If the ring size falls between two sizes, we suggest you order the larger one.